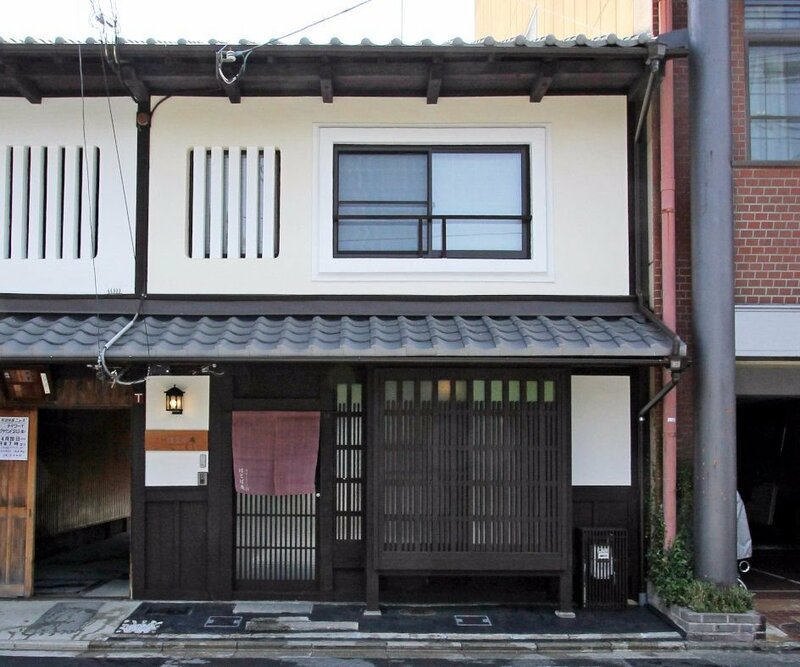 Hatoba-an is located on Furumonzen Dori (古門前通), a street that opened in 1603 and leads towards Chion-in, the head temple of the Jodo Shu (Pure Land Sect of Buddhism). 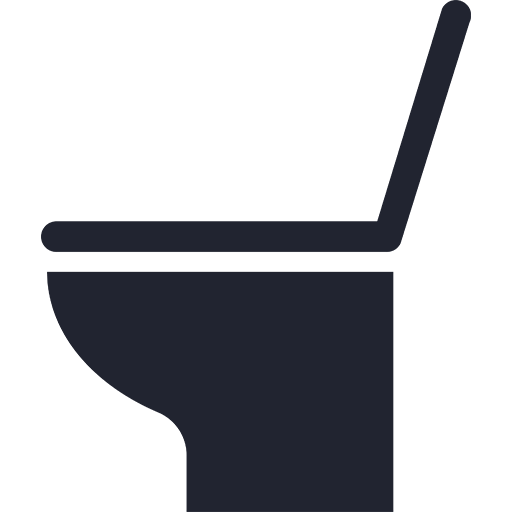 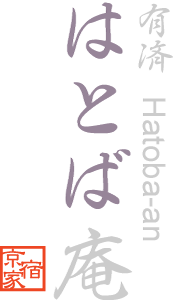 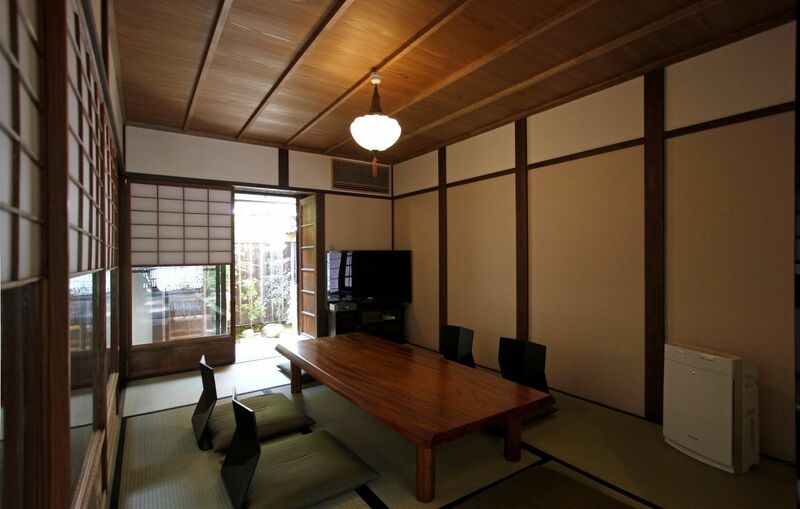 This area is a mecca for those who are interested in visiting some of the world's leading antique shops. 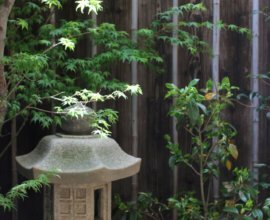 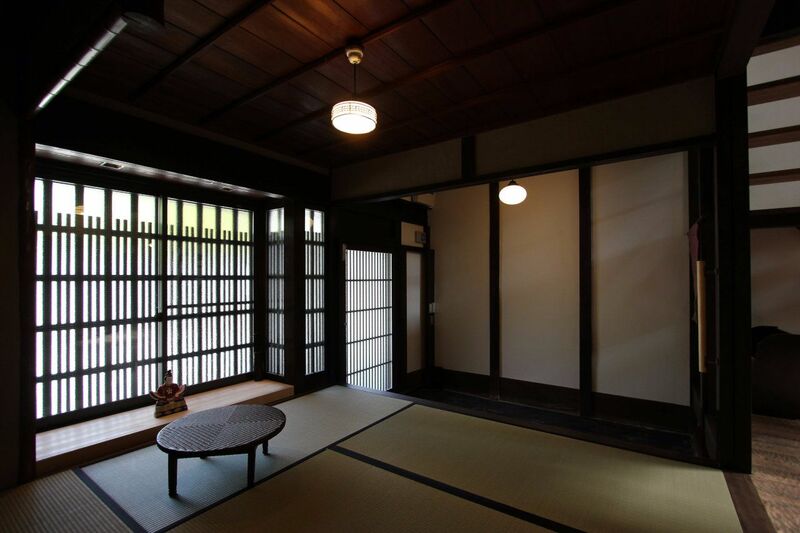 You will be able to discover rare finds including tea ceremony utensils, antique ceramic dishes, traditional furniture, and more. 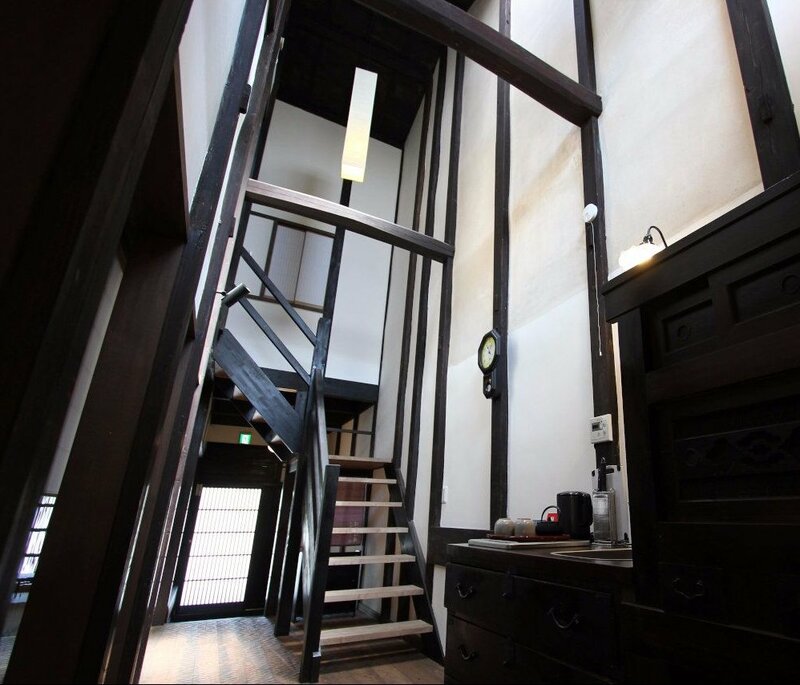 One step inside of Hatoban-an, and you will immediately be greeted with a sense of history. 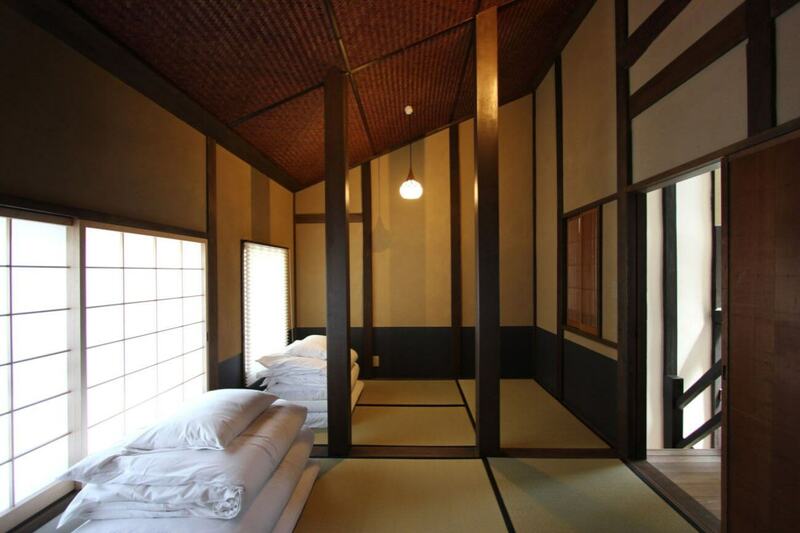 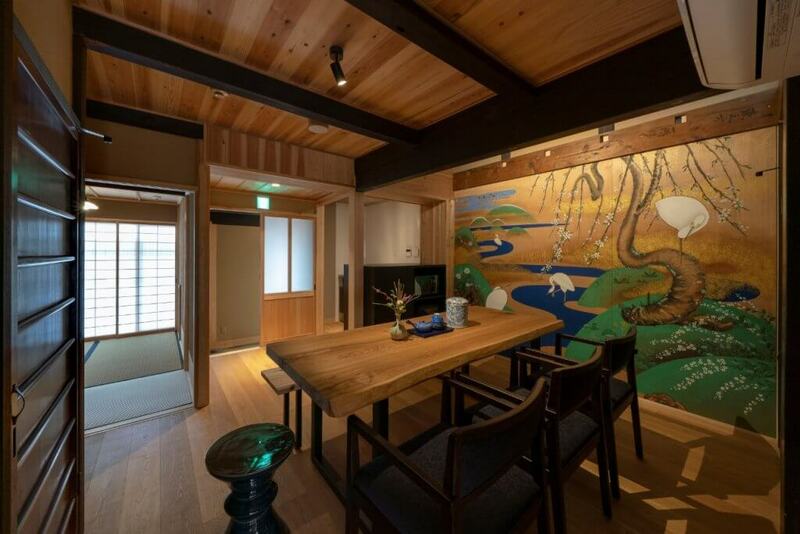 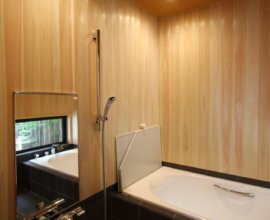 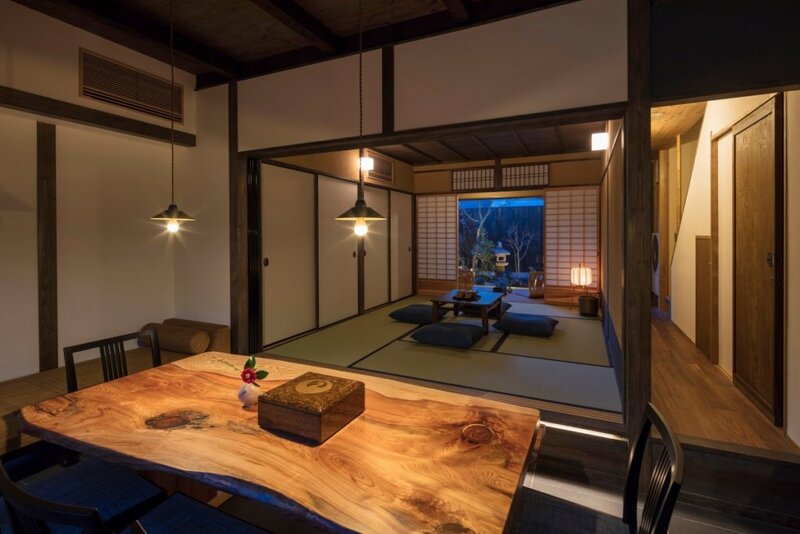 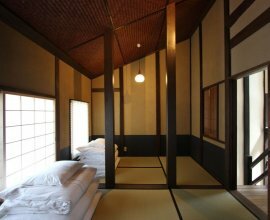 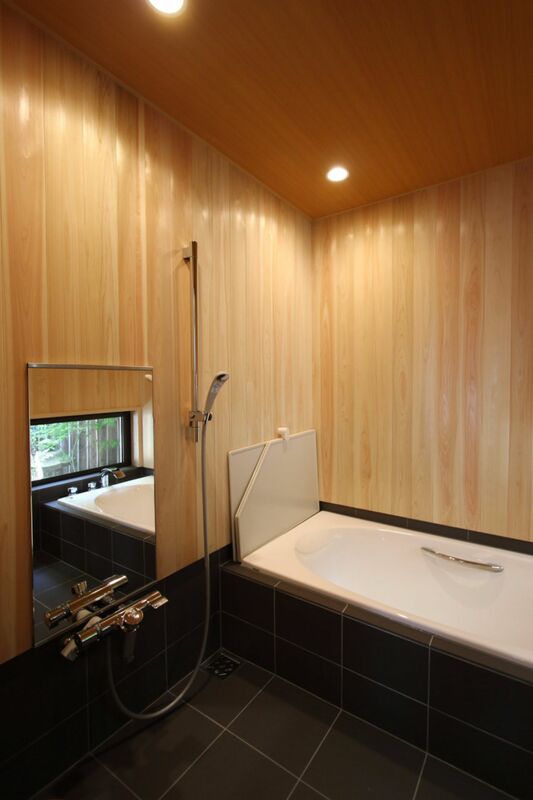 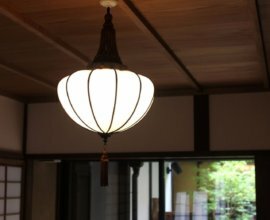 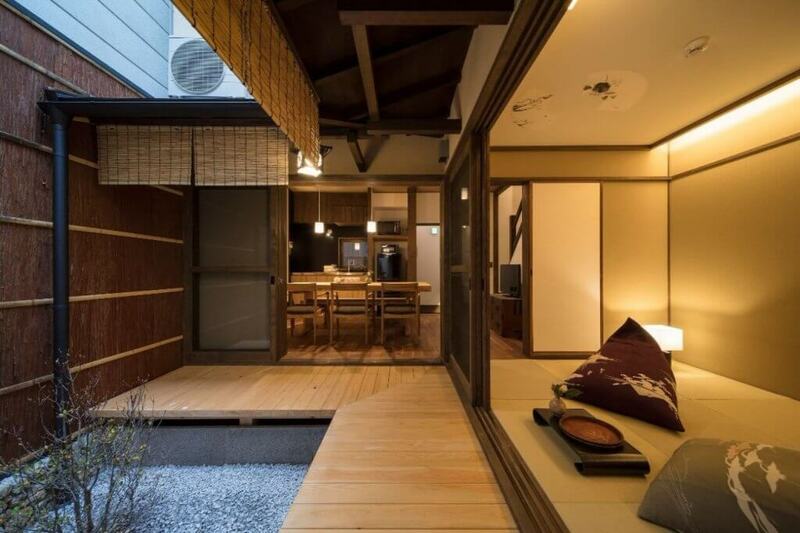 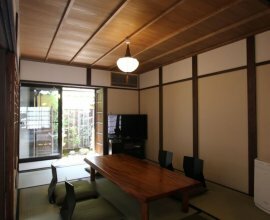 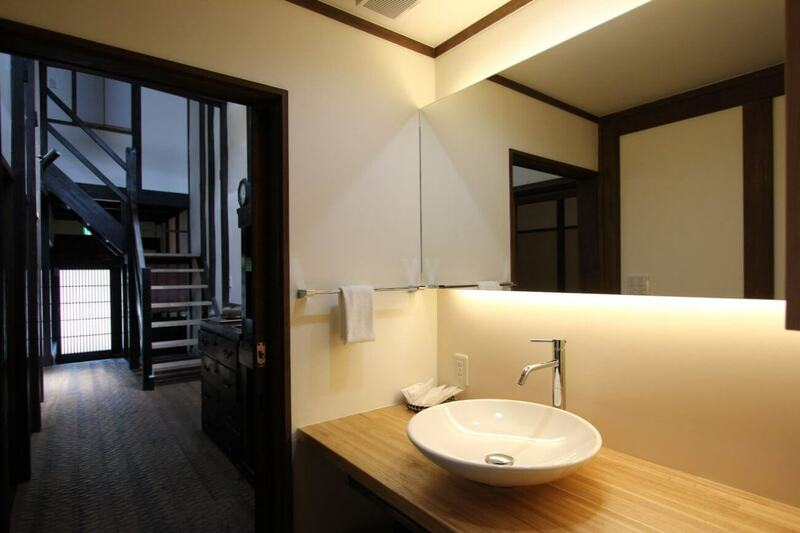 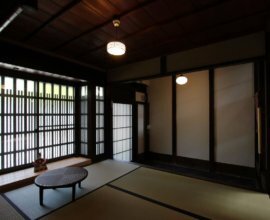 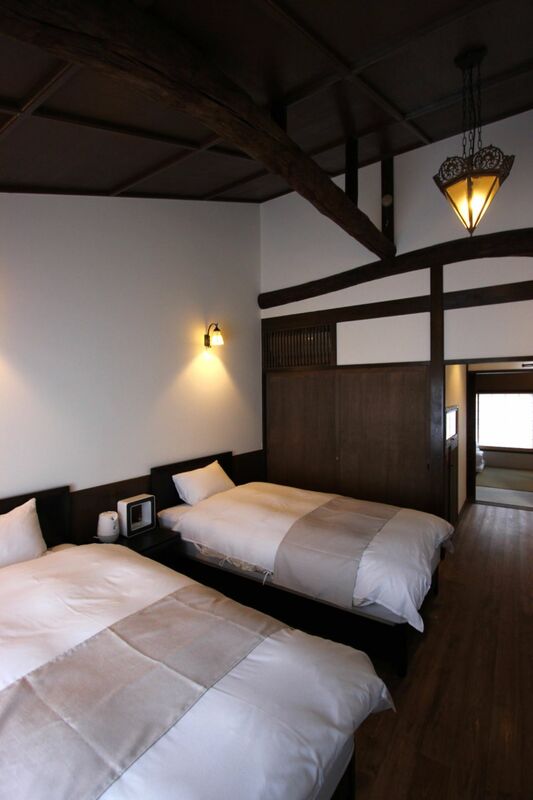 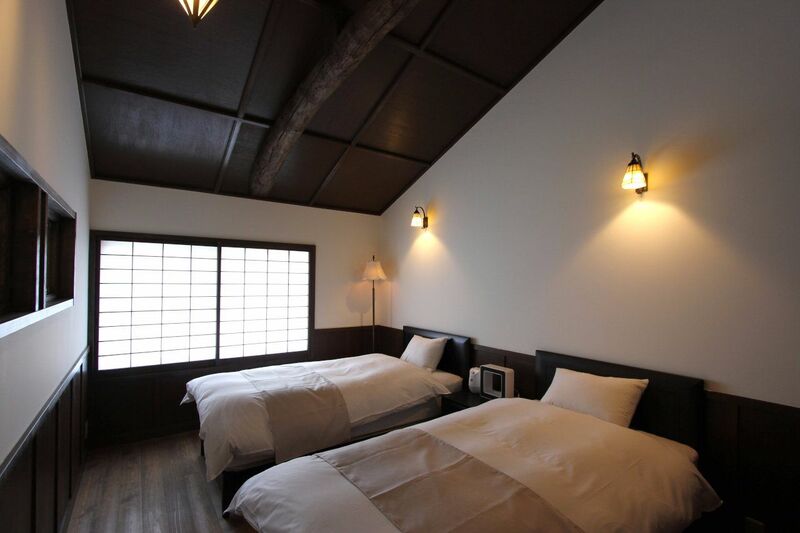 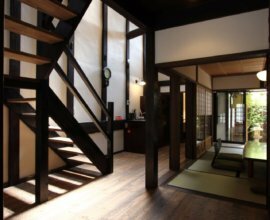 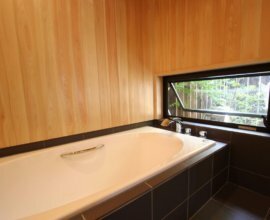 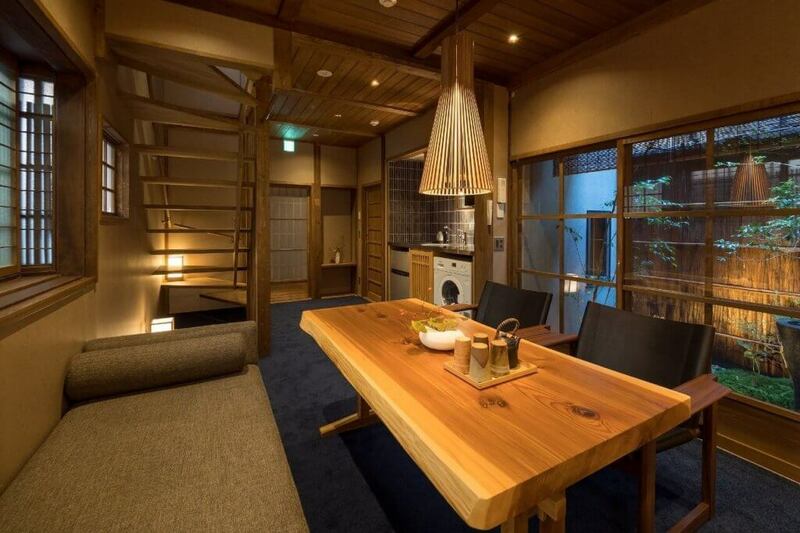 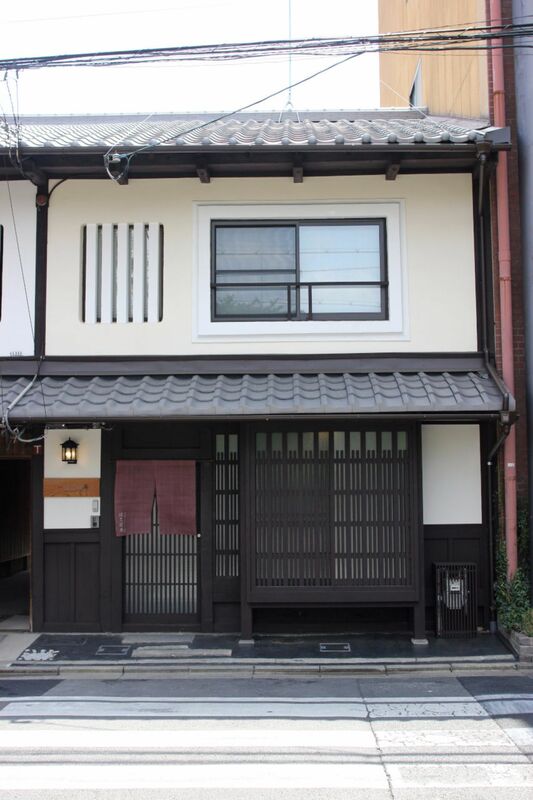 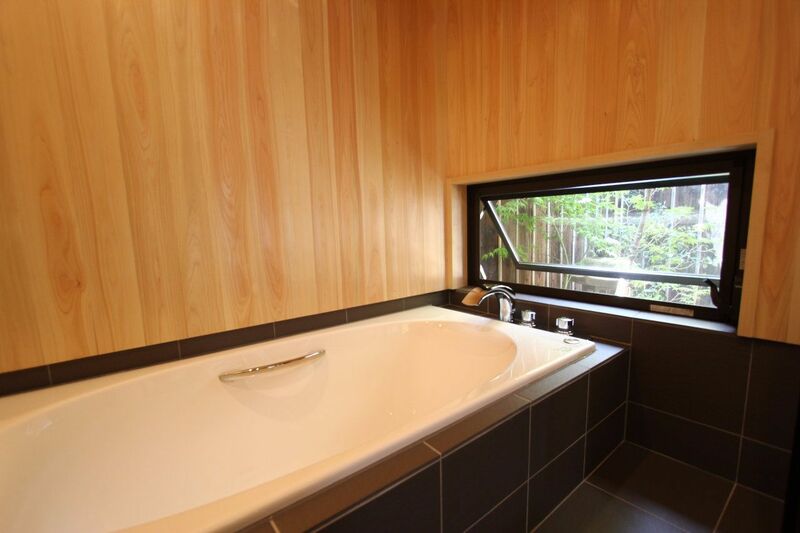 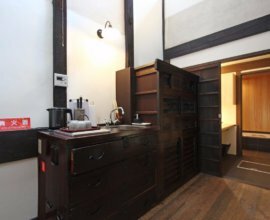 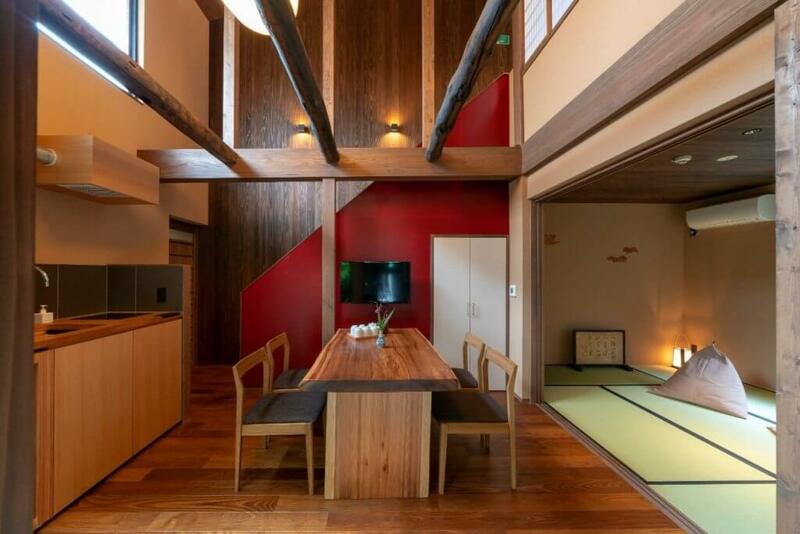 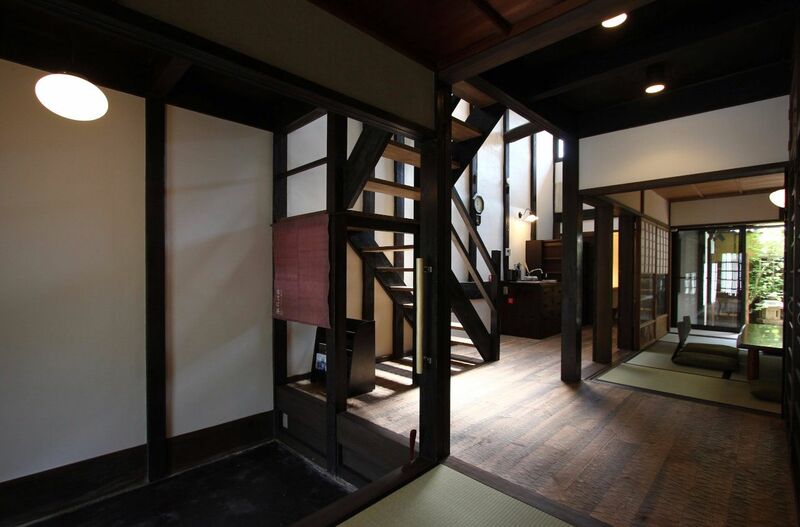 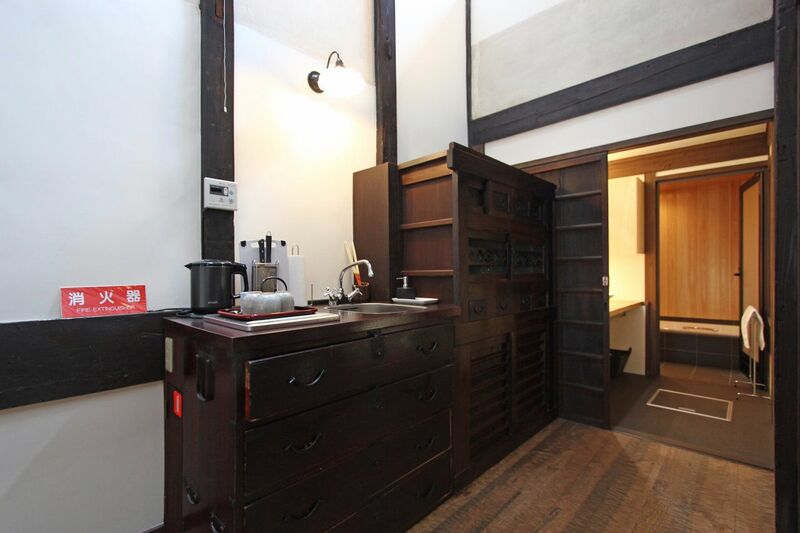 With exposed wooden beams, details of traditional Japanese elements, use of natural wood, and more, you will truly be able to appreciate the beauty of the machiya architecture. 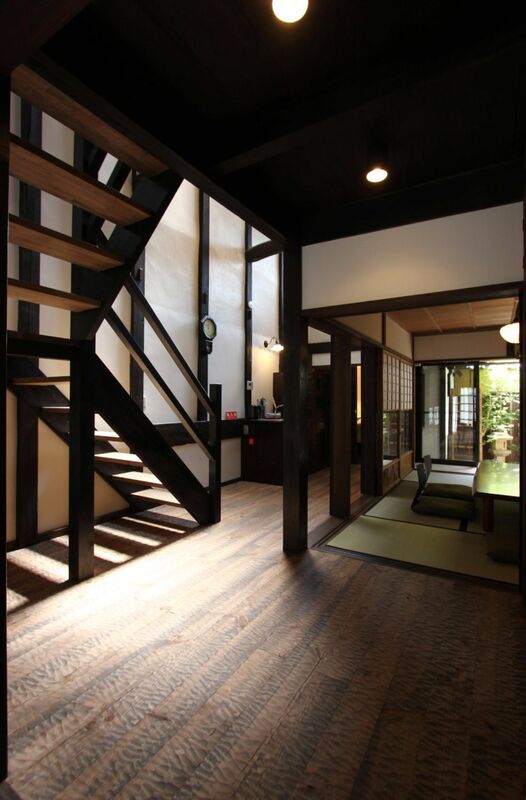 Stunning high-ceiling Walk inside and and draw your eyes to the sunlight pouring in from the high-ceiling ahead. 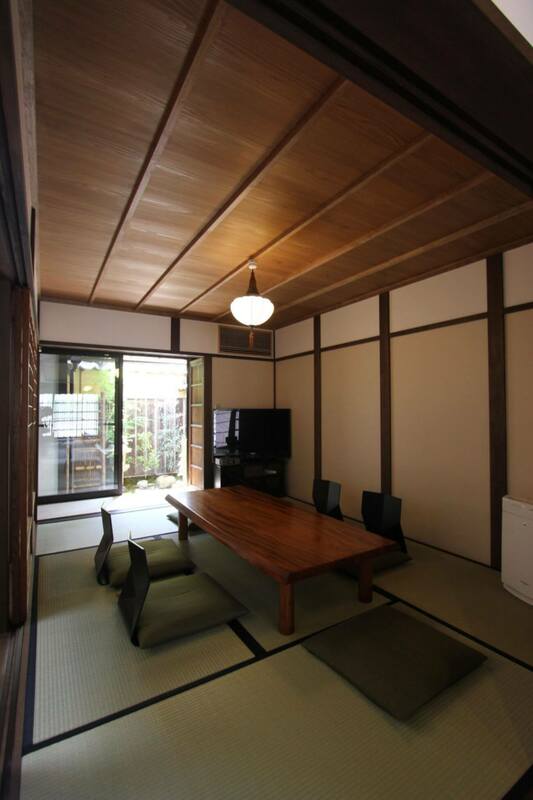 Marvel at the the open architecture and white plaster walls of this kitchen area. 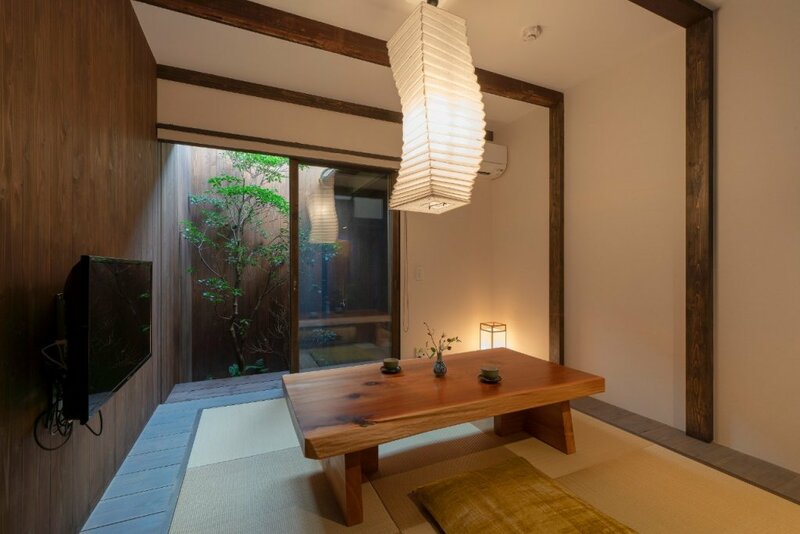 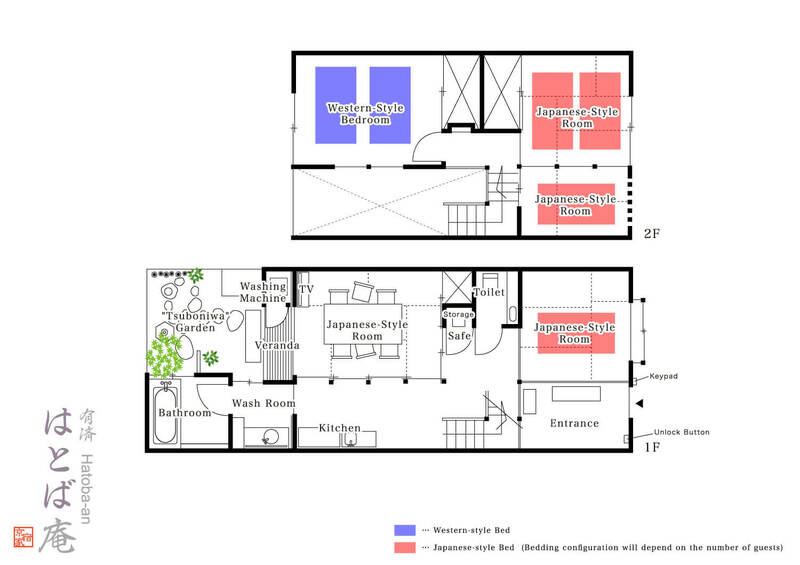 Traditional front room From the entranceway, step up into the elevated tatami room with lattice windows - a room that reminds you of a traditional Japanese shopfront. 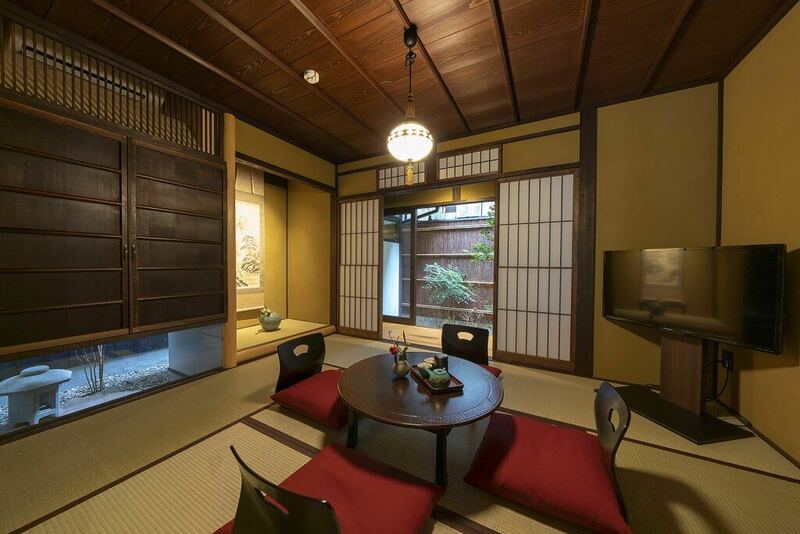 Japanese wooden wickerwork In the 2nd floor Japanese-style bedroom, discover intricate hand-woven wickerwork on the ceiling and sliding doors. 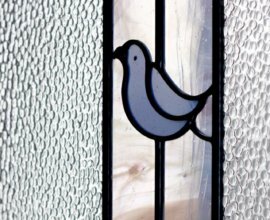 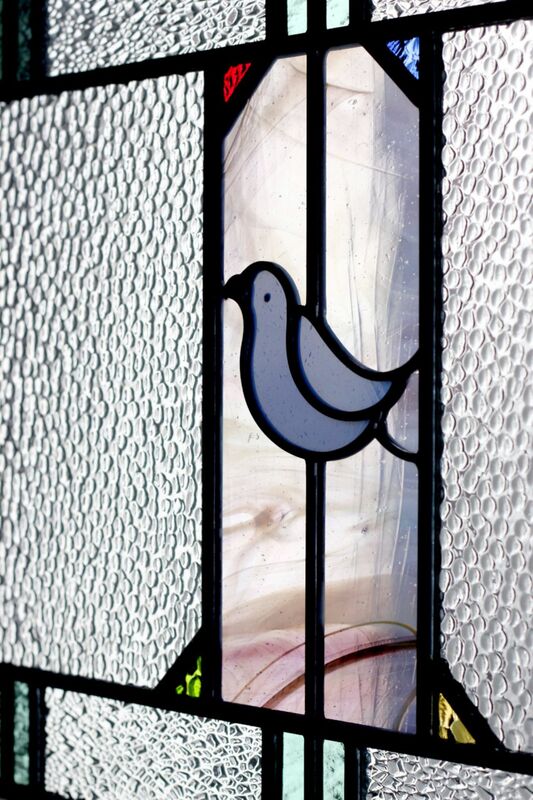 Their beautiful textures glisten in the light. 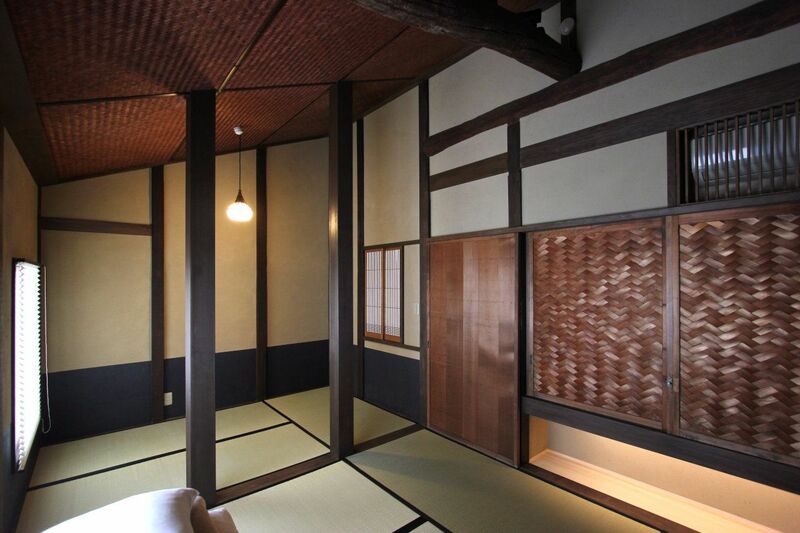 Living room Admire the shoji paper doors and wood-panelled ceiling. 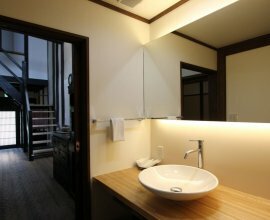 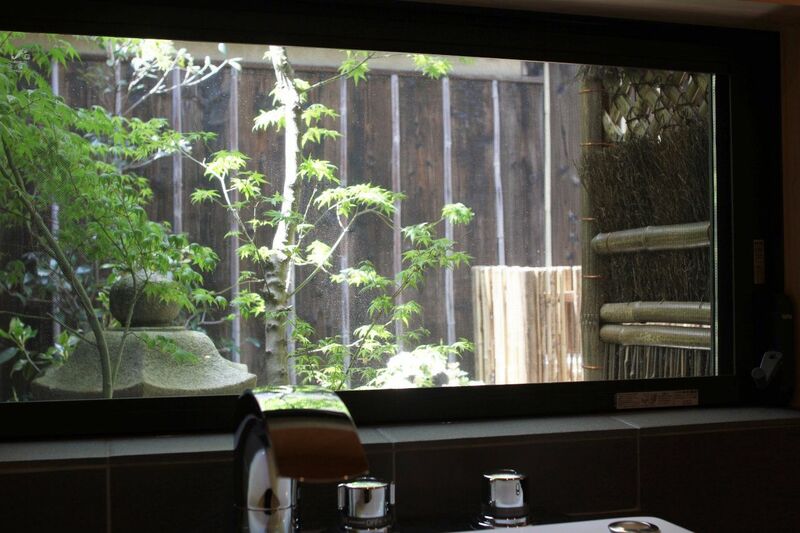 Open the doors into the fresh air, and view the inner garden from the veranda in the daylight or illuminated at night. 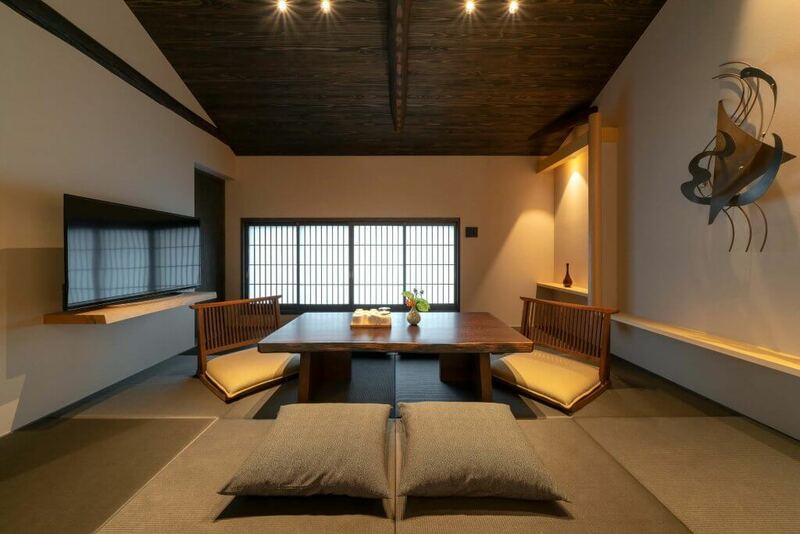 Western-style room The sloped high-ceilings with exposed architecture creates an open and serene space, perfect for rest. 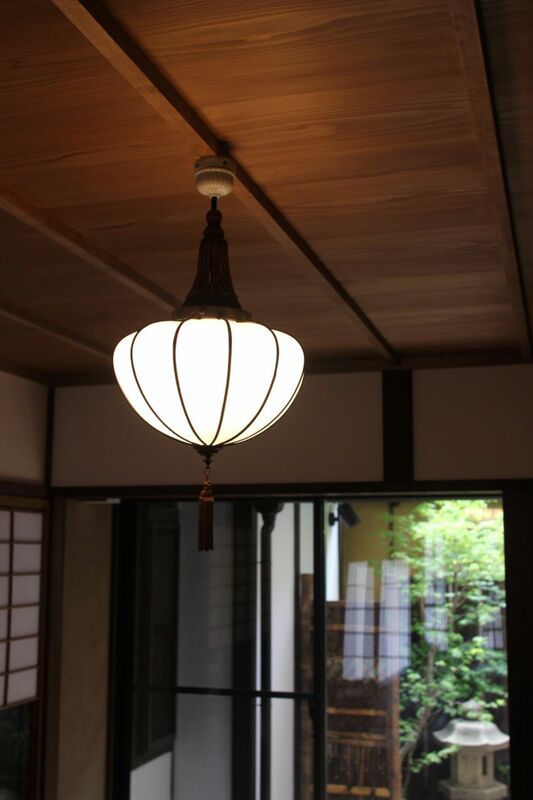 Antique light fixtures cast a warm glow throughout the room. 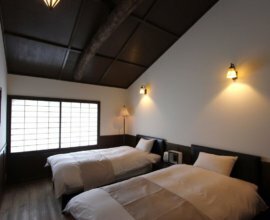 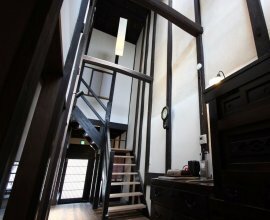 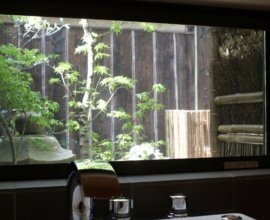 Exterior Recognize "Hatoba-an" by its traditional architectural features such as the black latticework, unique roof tiles and vertical "mushi ko mado" windows on the 2nd floor. 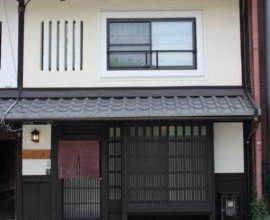 A 4-minute walk to Sanjo Subway Station and across the Kamogawa River from the central Kawaramachi district. 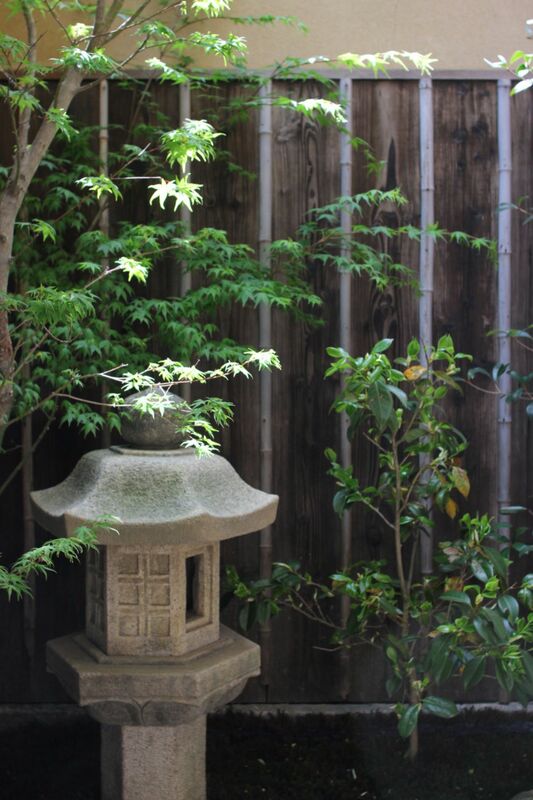 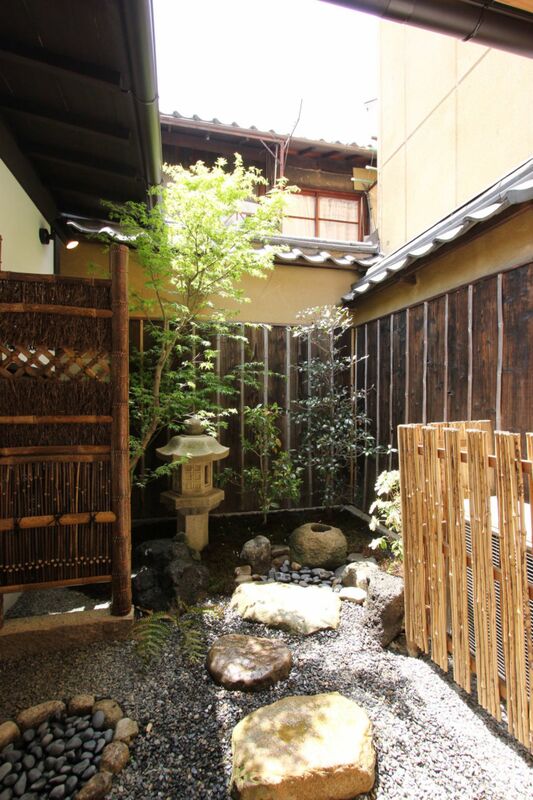 Located near “Gion Higashi,” one of Kyoto's five “flower” districts (花街). 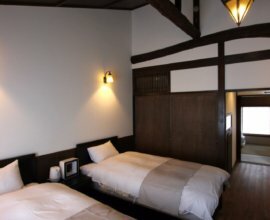 A short stroll south will lead you towards the Shirakawa Dori, where many restaurants and shops, housed in traditional wooden structures, along with cherry blossom trees (a popular area to view sakura in the spring) line the river. 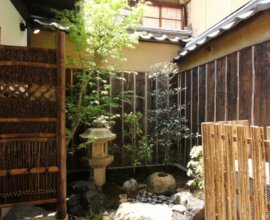 Streets are paved with cobblestone steps, and as you move further east, you will find the Shirakawa River lined with weeping willow trees. 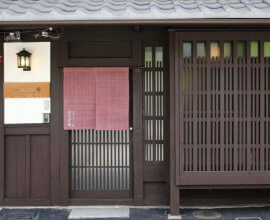 Head south towards the most well-known area of Gion, Hanami-koji Street. 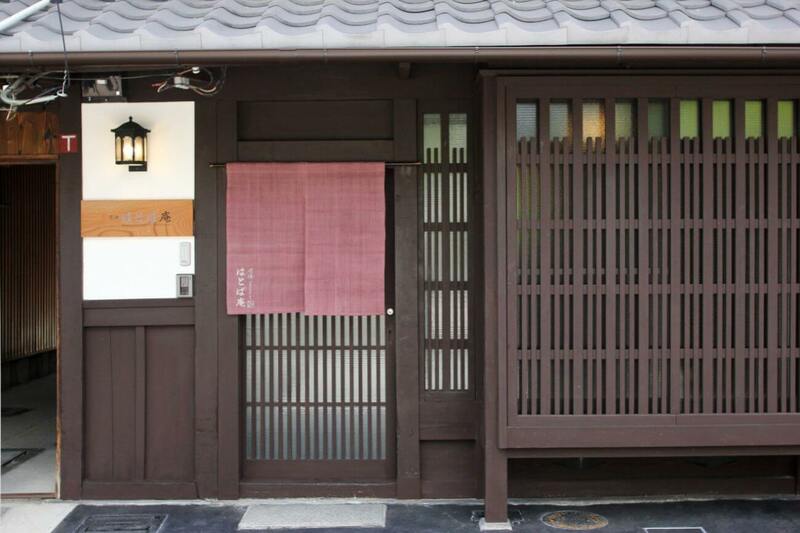 Although this area is full of tourists during the day, take a short walk from Hatoba-an as night falls, to view a photo-worthy atmosphere created from the warm glow of the traditional lanterns which dot the streets.